You know, it's amazing some of these places: You're walking down a shotengai thinking "Where the HELL am I going?". An old coffee shop, a Takoyaki stand, a drycleaner, etc; and then there it is: practically GLOWING in it's surroundings. The place you're looking for. 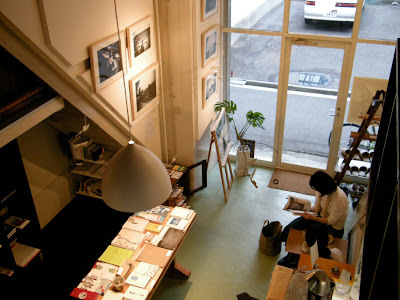 From JR Tamatsukuri, a 5 minute walk down the Hinodedori Shotengai • 日の出通商店街 is Beyer, a bookstore, cafe and library all rolled into one. 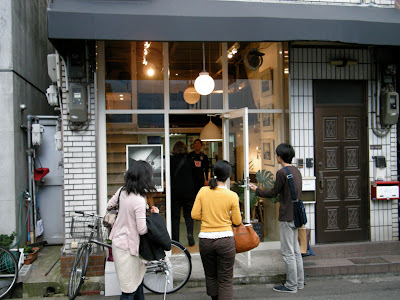 When I visited Beyer, there the space was also being used as a gallery, and the owner, Umeda San, has his office tucked away up the back on the first floor. It's the little things that make places creative, it really is. Also personally, I'm a bit fan of places that do everything at once. I don't think I've ever been to a library/cafe before. Beyer's library is located on the second floor of the shop, and has an excellent selection of books for creators. Though I was with company and, because of that, didn't have a good look around, the selection of Graphic Design titles was great, with a mixture of English and Japanese available. 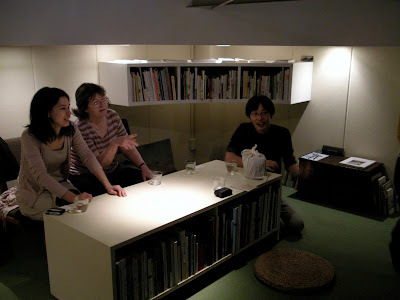 Sumiya San from Itohen took the four of us to Beyer (see previous article) because they sell quite a few German books. On the table in the middle of the shop a box of Christa's letter pressed postcards were available, and though I'm not sure of the exact history, Umeda San and Christa seemed to know each other well. I would recommend Beyer for someone wanting to get away somewhere quiet for an afternoon. You can also get there quite easily from Tsuruhashi Station (it's only a little longer to walk), if that's more convenient for you. Go and check out the book range, the exhibition, and browse the library! Hey! Check out why I'm doing this right HERE. Tsunagari D now on Google Maps! I've been to all placed marked in Red, and I'm planning to go to all marked in Blue. There's a lot to put it still, so it's not finished. Click below for a larger map! If you want to browse all the links I have for creative stuff in Kansai, click the link below! 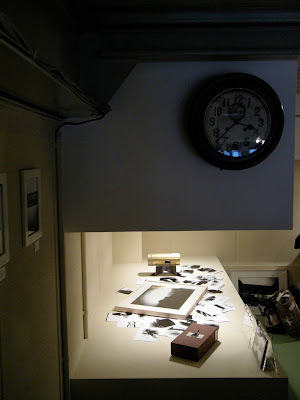 I'm an Australian living in Kansai (Japan), wandering around blogging about all the creative stuff I come across. I have a profound interest in Ji-beer (Japanese craft beer). I really like Kansai.